These are my thoughts on the performance of Japanese actor Takeru Sato on the last installment of the Rurouni Kenshin live action trilogy. With Director Otomo Keishi of the Rurouni Kenshin Live Action trilogy. You can access the full review on my sister blog, Nimotsu Counter. It had been a year since the Asian Red Carpet Premiere of Rurouni Kenshin: Kyoto Inferno, when the live-action team visited Manila. On the SM Megamall stage during the Asian Red Carpet Premier in Manila. August 6, 2014. “Keishi Otomo-sensei, said in an interview with Rappler that the fireflies were removed from the live-action movie because first, Kenshin’s and Kaoru’s love for each other was not yet established because only little time had passed from the time-frame of the first movie. In the anime, there had been a lot of episodes to show that love. Secondly, he thinks that drama scenes may be a bit off from the action-packed situation of the Shishio arc. More of my review in the original entry at my sister blog Nimotsu Counter. Puerto Princesa, Palawan is not just about the beaches. Situated about less than an hour from the heart of the city is a kingdom of bioluminescent insects in a place called Iwahig. And to update my post about it, which I originally wrote in 2014, the Kenshin-Kaoru firefly scene has been slashed from the live-action movie of Rurouni Kenshin. For those who are interested to read my review of Kyoto Inferno, you can access it in this link. A wall decor at the headquarters of Iwahig River. Photo by Nessa Gabrillo. It was 4:00 in the afternoon. After deciding to stay in Puerto Princesa for the night, Nessa and I checked in at a lodge near the airport and walked around the area. We met a trike driver who offered a price lower than the normal rates of Puerto Princesa tours. So we decided to take the firefly watching tour. Iwahig was a long drive from the center of the city. And we became feast to the hungry mosquitoes when we came to Iwahig River. There was a fee of 600 for boat rental, which can accommodate 3 people. And our tour started, this tour of firsts. First of all, I want to call out to the great Suzaku-sama, Byakko-sama , Genbu-sama, Seiryuu-sama, Zenki-sama, Kame-sama, Son Gokou-sama, Sailor Mars-sama, Clow-sama, Lupin-sama, Kenshin-sama, Belldandy-sama, Tamahome-sama and to Voltes V to grant me all the chakras, nens, and good luck I need to have a 100% probability that this letter can at least catch your attention. As of the time of writing, I am only able to muster 0.0001% probability from the said Gods. Maybe I also need to call on all the Mushi, the Kyojins, maybe even Escaflowne, the Gundams and Evas to send some positive vibes to this letter’s crusade. But kidding aside, and no matter what the odds are, whether this eventually reaches you or not, I am still writing it. Well I know you are currently on tour so I am sure you are having the time of your life. Just continue to smile to attract more positive karma. This year, I know that the sheep will continue to bless us, those who are born in the year of the dragon. Alright, I already said a lot but I haven’t introduced myself. My name is Sheen from the beautiful city of Manila in the Philippines. I was introduced to your music from “The Beginning,” thanks to the first Rurouni Kenshin Live Action movie. I was such a fan of the anime that I was thrilled when the live action was released in the Philippines in 2012. I started listening to your songs then. That was the time when it finally began. Two years after, in around mid-2014, I decided to quit my second job. And I was depressed again afterwards. Well, I was always depressed whenever I quit my job. It seemed like what I finally found wasn’t what I wanted. It’s that so-called quarter-life crisis, which is making the life of 20-somethings miserable. And I continued being a useless human being and locked myself up in my room for the next two months. “Can’t take your time what are you waiting for? It’s a waste of time for you blaming yourself. Just hold on tight, it can be all right. Yes, try to try, keep moving on. And it was like I was awakened from a bad dream. There came a realization so strong that I was instantaneously headbanged back to reality. Yes I was wasting my time and blaming myself for things that I shouldn’t be worrying about. And yes, all that I needed to do was to hold on. And then the positivity continued as Otomo-sensei, your friend Takeru and the rest of the cast visited Manila for the Asian premiere of Kyoto Inferno. I found something that I want. Posting for the nth time. 🙂 Photo by Ami Gatchalian. Right there and then, I knew I had already overcome my karasu and finally was living again in the real world. But real world had not lost its cruelty. 2015 came. The first quarter of this year was actually a roller-coaster ride of emotions. And it ended with another mighty long fall down to the bottomless pit of hell. It seemed that all the negative emotions from work, health, family and life converged to give me my fifth wave of quarter-life crisis. Now, I’m stuck in the middle, again. Ugh. And then that was it. Suddenly I was breaking past the lies. I was depressed again because I had completely forgotten how to DREAM. When did I stop searching for miracles? All I could say is that you never fail to take my hand and help me make it back again. You keep on reminding me of that very reason that keeps my heart beating, that thing that I’d risk everything for. And then you released your seventh album. And right there and then, I told myself that I would continue to support your band, so that you could continue creating songs that help people like me, millenials like us, to fight the challenges brought by this b*tch called life. I guess I’m ending this letter here. And I’m really wishing you could drop by Manila some time. Filipino fans are dying to meet you in person. If not, I’ll just find other ways on how I could hear these fascinating words of encouragement, and the music accompanying it, live. So to ONE OK ROCK, to you, to Toru, Tomoya and Ryota, どうも ありがとう ございました for keeping me sane. The author had also posted this open letter in another site called “Nimotsu Counter.” To access the post, kindly click here. 8/26/2014. Yes, this fangirl review was long overdue. Yes, Kabarkada retold my Kenshin childhood. Or it could have been the censorship of MTRCB during the 90s. Or was it the discretion of Studio 23 or ABS-CBN during those times? Or was it just my poor memory, which was worsened by stress and lack of sleep over the years? After watching Rurouni Kenshin: Kyoto Inferno, I and my dearest fangirl friend, Amilou, had quite a long discussion. I started questioning my not-so-reliable-memory about certain details in the anime. So I started my marathon of the anime’s Shishio Arc. But before I delve into the details, this review would give you three different perspectives: the Filmmaker’s, the Fangirl’s and Sheen’s point-of-view, which is a combination of both plus the comments of the writer in me. The film was technically remarkable as what was expected after the first movie. However, I found the opening scene a bit dark. I actually wondered how Saito (Yosuke Eguchi-san) and the other policemen registered to the camera with very little lighting, without being too grainy and defocused. Did they shot in film or digital camera? But then, when the doors to Shishio’s fires of hell were opened, the question about light sources readily vanquished. The fight scenes were superb as ever and I really commend the fight director, Kenji Tanigaki-san for this. The performances of most of the actors were also applaudable and I really loved how Takeru Sato did the battoujutsu stance. I would like to congratulate him for that fight with Cho wherein he was in that signature position, without showing signs of being tired, for maybe around 5 minutes or more. I was also looking forward to Ryonosuke Kamiki’s portrayal of Soujiro Seta. So far his performance in Kyoto Inferno seems ok, but the challenge would be in The Legend Ends where his past will resurface because of his second fight with Kenshin. Tatsuya Fujiwara-san’s performance was also remarkable. Acting and portraying emotion in a fully-bandaged face was no joke. I said “most of the actors” because I found Tao Tsuchiya’s acting a bit underwhelming, especially in that scene when Misao saw Aoshi “kill” Okina. That reaction simply did not suit someone who saw the man of his dreams “kill” the one who took care of her since she was a little girl. I also appreciated Kenshin’s change in wardrobe. The leaving behind of that red yukata given to him by Kaoru symbolized Kenshin’s attempt to rid himself of the rurouni life to venture once again to being a hitokiri. In which, according to the trailer of The Legend Ends, will be given back to him by Megumi. But why her? This is something that needs to be further explained in the third installment of this adaptation of a Nobuhiro Watsuki-san masterpiece. I also loved that blue yukata that Kenshin wore in that scene when he changed the handle of Shaku Arai’s original sakabatou. This scene was a variation from the reveal of Arai’s signature engravings in the anime but it gave another perspective on Kenshin’s knowledge about swords. And of course, the scenes would not be complete without the exceptional musical score. The one that sent the most shivers down my spine was the background during the bridge battle scene, when Kenshin attacked Shishio’s men who were about to burn Kyoto. It started with some nerve-wracking vocals, but instead of orchestra, drums and electric guitars followed making it insanely awesome. I just wished there were English/Romaji versions of the final credits. I wanted to see the names of the production team and congratulate them in my head. I also wanted to know the locations of the shoot. I want to include them in my Japan itinerary in the future. I also wanted to know who among the actors required stunt doubles or if they themselves where doing all the moves. Also, according to Rappler’s article about Kyoto Inferno, the film utilized around 5,000 talents, I just hoped they were credited because the closing billboard only lasted around 4 minutes, within the duration of the song Mighty Long Fall by One OK Rock. The usual Hollywood credits were about 3 to 4 songs long. 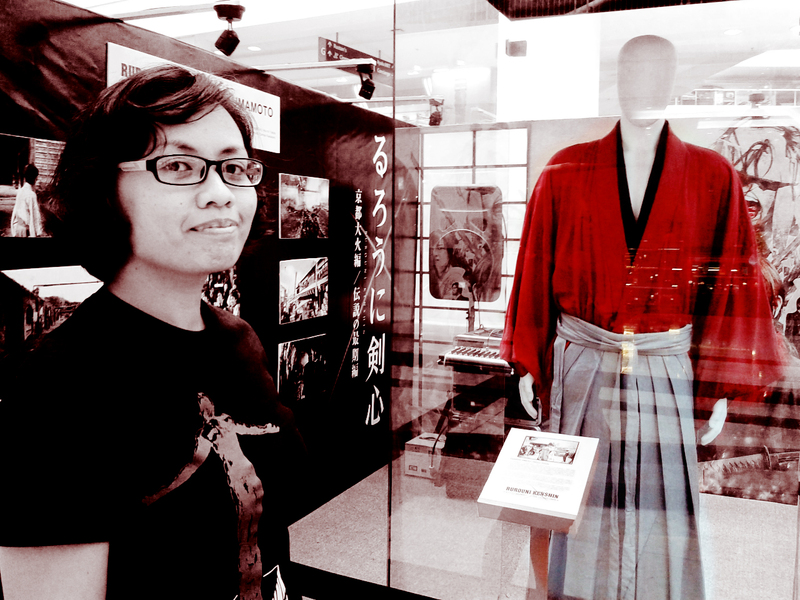 With the signature RED yukata at the Glorietta exhibit. As what I mentioned in my previous fangirling entry (click here to read), I grew up with the Studio 23 broadcast of the then english-dubbed Samurai X. It was a shame that I was calling myself a fan and not remember anything about the Purgatory, the Ikegaya or the Burning of Kyoto and even Tokyo being Shishio’s real target. But it seemed that it wasn’t only me. Amilou also can’t remember any of it, even my brother who was with me when I watched every succeeding replays of Samurai X that happened in Studio 23. We all grew up with Kenshin as a Kabarkada. The copy of the anime that I was able to find online was English-dubbed. And true enough, the Purgatory and the Ikegaya really existed in the anime. I knew at once that my memory was not to blame. The english-dubbed that Studio 23 broadcasted called Kaoru as Kaori and Yahiko as Yoshi. This one that I found online called the second master of Kamiya Kashin as Kaoru and her apprentice as Yahiko. Kabarkada‘s Kenshin also told me that Aoshi was pronounced as Ae-yo-shi when it was really Ah-oh-shi, which was how the live-action movie and most probably the Nihonggo anime pronounced it. Same thing happened with the name of Usui. And so I came to the conclusion that this part might have been cut either by MTRCB or by Studio 23 or by ABS-CBN (in case of the Tagalized version). Well, cutting scenes was a trend then, especially with what they did with Neon Genesis Evangelion. But that was a different story. MTRCB might have thought that burning a whole town was a rebellious insight for kids to watch during those times. And this was how they retold my childhood Kenshin memory. 😀 Photo by Amilou Gatchalian. The first Kenshin movie still had time to show emotion and to let that emotion sink into the hearts of its viewers. It had time for Kenshin to think and to look up to the sky. It had time for Kaoru to cry and look into Kenshin’s eyes. It also had more time for the fight scenes, it even had the luxury of slowing the most awesome moves down. But Kyoto Inferno did not have that advantage. The fangirl writer-filmmaker in me said that it could have been three movies, each portraying around ten episodes from the 34 episodes of the Shishio Arc. But they made just two films. And now everything felt squished. Keishi Otomo-sensei, said in an interview with Rappler that the fireflies were removed from the live-action movie because first, Kenshin’s and Kaoru’s love for each other was not yet established because only little time had passed from the time-frame of the first movie. In the anime, there had been a lot of episodes to show that love. Secondly, he thinks that drama scenes may be a bit off from the action-packed situation of the Shishio arc. For me, a film is all about portraying emotion, and letting the viewers feel that emotion. The Shishio arc might have been concerned more on saving the whole of Japan but still, the twists had their roots on certain emotional dilemmas of the characters. So I think emotions had the right to be felt. And this is what they call “letting the audience breathe”. Regarding the love that was not established, I think a passage of time could have worked. Kyoto Inferno could have started when the love among them was already fully established, not only between Kenshin and Kaoru but also for their whole family, including Sanosuke, Megumi, and Yahiko. And the fireflies scene could have been saved if Okubo’s assassination happened at sunset, as my fangirl friend Amilou suggested. Then by the time Kenshin already made his decision, it was already night and the fireflies could have appeared during the goodbye scene. But I believed the more important thing about that scene from the anime were not the fireflies but the fact that Kaoru cried. In the anime, she even locked herself in her room and was miserable days after that goodbye. And there was this scene wherein Megumi was about to slap her in the face just to tell her that the feeling is worse for not even able to receive such a goodbye. This simply meant that they all were badly hurt about Kenshin’s decision to go to Kyoto. But in the live action, Kaoru never shed a single tear for that. There was a line there wherein Megumi told Kaoru not to pretend that she was all right after that goodbye. OK. Maybe too much drama like crying could have ruined the atmosphere but I just wished this scene wherein Kaoru was looking at Kenshin’s red yukata could have been extended even just for a few minutes, enough for the audience to feel Kaoru’s pain. Nonetheless, there were no crying on-screen but the tears seemed to have transported instead out of my own eyes. I did not know if Otomo-sensei planned it that way, but ok fine, I still cried during those scenes. Next were the fight scenes. I wrote earlier, yes, that they were superb. But the fight scenes were put so close to each other that the audience were not given enough time to breathe again. I was still digesting the first fight scene when the next was already introducing itself. Nonetheless, they were still outstanding, but could have been more glorious with slow motion. Next, and I believed the most important comment of all, was the kidnapping of Kaoru. My immediate reaction when I saw that in the movie house was “Why?”. First of all, Kaoru was never a damsel in distress. Kaoru was a strong woman who carried the spirit of the Kamiya Kashin style with her. And the kidnapping of the leading lady was so cliche. According to Rappler’s interview again, Otomo-sensei explained that for him, the kidnapping was a trigger for Kenshin because, though the love was not yet established, Kenshin could not afford to lose someone with whom he shared a common advocacy with. The Kamiya Kashin style was for protecting the people, and not harming them. And this too became Kenshin’s beliefs as a wanderer. But I was not satisfied with this explanation. But after my anime marathon, I realized that maybe Otomo-sensei and the rest of the creative team needed something that will make Kenshin worry during his battle with Shishio. In the anime, when Kenshin, Sanosuke and Saito arrived at the Shrine of the Six Arches to face Shishio, Yumi told them that they will be fighting only three members of the Juppongatana because the rest were sent to extinguish the Aioya where Kaoru and the others were. And this made him worry all through out his three battles with Aoshi, Soujiro and Shishio. In the live-action movie, Kenshin and the others already won the battle in Aoiya before Kenshin went to the Purgatory so the only thing now that would make Kenshin worry the most was no one but Kaoru. OK FINE. And now, I am really looking forward about the pay-off of all of these on the Legend Ends. The trailer says that Kenshin would be executed and I am asking “why?” again this very early. Then Megumi seemed to be playing a bigger role here in the live-action than in the anime for the Shishio Arc. The trailer also suggested that all the succeeding battles, well except for Aoshi’s, would took place in the Purgatory, which I think was a good idea because I personally don’t think that such a big vessel would sink just because of Sanosuke’s home-made bombs, just as what happened in the anime. Rurouni Kenshin: The Legend Ends. Opens September 24, 2014 in the Philippines. Photo by Amilou Gatchalian. This post had also been posted by the author to another blog named “Nimotsu Counter.” To access it, kindly click here. The RK Team during their visit to the Philippines. I believe that the 90s was the golden age of anime in the Philippines. I was in elementary then, and I was introduced to early anime intoxication and addiction. Rurouni Kenshin, the anime, was first aired by Studio 23, on June 1998 and was English-dubbed. The following year, ABS-CBN aired it on September 1999 and was Filipino-dubbed. This information was thanks to my dear friend and fellow fangirl OF THE ANIME ONLY, Sheig. I was readily hooked then in Studio 23 since the timeslot was at seven in the evening. I was on my fourth grade then while my brother was on his first grade. My father used to get mad then when I and my brother would not do our homework just because of watching anime. And he would really remove the TV antenna, just to make us do our homework. So, seven in the evening was the perfect time to be a fangirl. And that was the reason that kept my heart beating. My Rurouni Kenshin Movie 1 Poster. It was on July 26, Saturday when I first heard of the news that the RuroKen cast and director would come to the Philippines. And I was in Singapore then. I am an event writer. So I first asked my event contacts if they know who were the possible organizers of the event. All I got were trunkline numbers. And I thought they were of very little use. And then on August 1, one of the leading malls in the Philippines released a Facebook promo for event passes for the Red Carpet Procession of Rurouni Kenshin. I was never lucky when it came to promos, raffle and the kind of stuff but this was just really where I could begin. On August 2, Saturday, I told my mother in Bataan (a province north of Metro Manila), that I would not be able to come home to get my poster of the first RK Live Action movie so I asked her to send it via courier service. After two hours, (yes that’s how much my Mom loved me) she texted me that she was able to send it and it would arrive on Monday. On the morning of August 3, they released the question for the third batch of winners. And finally, I won. On the night before the Red Carpet Procession, though swamped by work, I was able to find out that one of my colleagues from film school was part of the video coverage team hired by Warner Philippines. And she became my ever reliable source for this escapade. Yes, with Kamiki at the background. It was already 5:30pm but still I could not see any of them on the stage. It was August 6. I was there at 12nn at one of the biggest malls in Mandaluyong City. And when I got there, I was disappointed about the set-up. In the area where the promo winners where supposed to be, there were high barricades and another line of stanchions in front of that. Define security. Define layers of security for the supposedly “privileged” promo winners. This Japanese reporter was about to interview the fangirls beside me at the barricades. One of the girls’ arm was resting on the barricade and seen here at the lower right hand corner of the photo. And according to this set-up, after the barricades were the press. Then the stanchions. Then the red carpet. Then the stage. Define layers of security for the supposedly “privileged” promo winners. The video was from another friend, Pat Lugartos. And good grief. Outside the stage area, the security was minimal, compared to the security given to our area, so fans positioned at the red carpet area were able to get their precious autographs. The mall management told me, when I got my passes, that even promo winners would not be given autograph-signing opportunities. And then this. My heart broke. Where is luck when I needed it most? Am I really this unlucky when it came to these things? Gah. When the team finally got near the stage, we, the promo winners, tried our best to stretch out our hands so that any of the RK team would get down from the stage and sign them. But to no avail. How could you notice the arms stretching behind the lenses and the microphones of the press people that were in front of us? Good grief. I really thanked the mall management for this very awesome privilege they had given their promo winners. So when the show finally started, the scenario was this. Great. The promo winners were really “privileged”. I tried raising my poster to catch their attention, hoping they might come down and sign it. But the poster was too big for a little Filipina like me. It was cinema size so it was really huge. I really believed that Otomo-sensei saw it because I saw his smile changed when he glanced at our direction. And Munetaka-san too. The program ended and my poster bore no trace of an autograph. And apparently, the event passes we got were just for the Red Carpet Procession and not for the premiere. And that was another privilege for the promo winners. Great. I told myself that I would not settle for just this. I asked my colleague if she had the power to have my poster signed. She told me there would be no guarantee. But I took the risk. I gave her my poster and I started crossing my fingers that night as I and my friend enjoyed our bottles of Tanduay Ice because of too much frustration that day. We were tipped that the RK team was going to a restaurant in a big mall in one of the business districts of Metro Manila. AND WE WERE STUPID ENOUGH TO NOT GO THERE THAT NIGHT. After almost a whole day of spending time with the RK team, work came running after me the day after. I needed to finish revising my script in the morning of August 7 and I had a meeting in the afternoon. My meeting ended at 4:30pm and I rushed to another big mall in Makati just to see the RK team again. I paid an awesome amount for the passes just to have the same experience like the Red Carpet Procession. There were no privileges given to those who have passes. We had the same experience as those who did not purchase the passes. And since I thought this was my last chance, I did a first on this day. I, literally, ran after them, still hoping to have an autograph. Just when the on-stage program was about to end, I ran towards the barricades on the path where they will exit. But they did not give away any autograph that day. Maybe they were told by the management not to, after what happened the day before. And so after the event, we sat there waiting for my colleague, hoping that my poster was signed. She invited us to a hotel where they were dumping their video files. And there, she told me something that made my “world fall apart”. My colleague said that she had to rush to a meeting this afternoon during the mall event so she entrusted my poster to her friend from Warner. But just before we came to the hotel, the poster was discovered missing and was said to might have been accidentally included in the signed posters given away by Warner on the program that afternoon. Did luck really hated me? They sure were Japanese. For us Filipinos, we would normally arrive at the airport around three hours before our flight. But they were getting ready to go to the airport when we arrive at the hotel lobby around five hours before their flight. When the cab made a turn to drop my friend Ami and I in front of the hotel lobby, I already saw two vans waiting outside. I became worried. But right in the nick of time, when we came down from the cab, Otomo-sensei just told Munetaka-san that he would go the van already. I readily asked him for a photo and he granted our wish! And the “Arigatou sensei” that I told him after the photo opportunity was probably the most heartfelt “Arigatou” I ever said in my whole life. And then we sat there waiting for Takeru. I saw again, for the third time, this cute Japanese guy who apparently was from Warner Bros. Japan, according to my ever reliable source. The guy who caught my attention. Photo by May Natorilla. I saw him first on the event last Wednesday, then on Thursday and when we went to the hotel to see my colleague. He really got my attention and because I was looking at him, I did not notice that Takeru already passed by, who went straight to the van. I apologized to my friend, who was a Takeru fan. I said I was distracted. Anyhow, Otomo-sensei was really my number one reason for going through all of these and my friend got her photo with Munetaka-san anyway so we left the hotel grinning. And that was the perfect ending to a rollercoaster fangirling escapade. God really was the best writer and plot-twister in the universe. And now, that was what I call luck. Maybe God won’t just give it away that easily. And maybe He just gives it to people who worked hard for it. Thank you Lord for this. And to Otomo-sensei and Munetaka-san, “度もう ありがとう ございました”, for accommodating us. P.S. I wrote “Philippine Leg” because my friend and I were planning another fangirling escapade in Japan. HOHOHO. But we still need to earn more money for that. 🙂 And to the person who got my poster, please, I am begging you. What can I trade you for that? Or can I buy it? You could message me here if ever you got to read this. This post had been transferred by the author to another blog named “Nimotsu Counter.” To access it, kindly click here. Posted in Adventure, Anime, Happiness, ONE OK ROCK, Photography, Transfer	Tagged die-hard, fangirl, Keishi Otomo, Munetaka Aoki, one ok rock, Philippines, rurouni kenshin, Sato Takeru, Takei Emi, the beginning, The Kyoto Inferno, Warner Bros. It was my first time to ride a katig boat so I was a bit nervous. It was this narrow boat with wooden balances at the sides, known as the katig. I know how to swim but when our boatman said that the river was about 30-40 feet deep, all I did was tighten my grip. And then the boat man told us to take a look at our right side. And there we saw a bunch of fireflies on the Bakawan or Mangrove trees. Although it was a bit cloudy that night, we were still able to see the starry sky. It was as if the stars were reflected by the clear river water to the Bakawan trees, thus signalling the fireflies to give out their lights. Stars and fireflies were a very refreshing combination, sights that one would never see in other cities in the Philippines. If only the boat ride was not timed, I would have wanted to spend the night there, just watching the stars and the fireflies as they all send me to dreamland. I just wish my camera could capture the sight so I could share them with you. Maybe these were some of the things made for my eyes only. And for yours also when you finally come to visit Puerto Princesa. The show became a trending topic worldwide every single night of airing, for the whole five weeks of conquering primetime television. The launch was a 2-part special in the wonderful islands of Batanes. With two launches at the first quarter of the year, one may think that I’m doing good at work. But it was not that simple. Work is not only the act of doing what you need to do at the work place. A lot of factors and outside consequences contribute to my decision to finally hear what my heart has been telling me for the longest time already. I believe one of the highlights of my 2012 was my resignation at my job then as a Promo Producer. Quitting a job is not easy. It’s like saying goodbye, for good, not just to the work load but also to friends and colleagues. Drafting a resignation letter is a piece of cake, but gathering all the guts to submit it and finally tell the boss is a whole new baking process. Luckily, after months and months of brain-wrecking decision-making sessions, on April 24, I was able to bid everyone goodbye. Here is a late christmas gift I received from a friend named Nessa Gabrillo. The lanyard was on a buy-one-take-one promo on The T-shirt Factory and so she has the same lanyard and said she will wear it to work. Being my first out-of-the-country trip, this one is really memorable. And simply because I was with the most awesome people in the universe. Our adventures and misadventures in Hong Kong and Macau is detailed in Oh Yeah! This is First World! And speaking of writing, I started blogging on August. And so here’s my baggage counter. Our Mt. Batulao trip was the lucky one to be deposited here first. You can view it here: Ang Labing-Tatlong Rurok ng Bundok Batulao. I believe I experienced my first wave of quarter-life crisis after my college graduation: the pressure to find a job in the soonest possible time, a job that should be related to my field of study. This was accompanied by one of the greatest dilemmas in the world: which path to take. Then, I decided the path to TV5. During the time I resigned, quarter-life crisis came haunting me again. And Diana Ross’ “do you know where you’re going to?” song became the official soundtrack of my life then. I believe this is the downside of the freedom I got. I was given all the time to think. Even the things that I need not to be thinking of eventually entered my mind and I cannot stop them. Eventually, I happened to see the good side of quarter-life crisis, it let’s you discover who you really are. Maybe the good side of this too much thinking is that I was able to seek the deepest portions of my conscious mind. Even my subconscious gave me hints on who I really am. In one of the rakets that I managed to get, I did research on some psychological stuff that ended up triggering my suppressed memories out. I had reasons for suppressing them, reasons that eventually turned to questions that I address to God. But may I say that these were not the kind of questions that doubt His greatness but rather questions that later on turned to requests to make me understand why these particular things happened to me. And during this second wave of quarter-life crisis was the time when God granted my requests. Caloy’s story would gave you a hint on what I’m talking about here. View it at: Caloy, the Infamous Master of an Infamous Art. I would want to thank all the people who entrusted their projects to me. Like I was always saying, I really have difficulty dealing with technology, technobobo ika nga. But recently my Nokia 6680 phone, yes my NOKIA 6680 phone finally wanted to retire from its almost 8 years of service. So I finally need to buy a new one. At first I was hesitant to buy techie phones because a phone that can text, call and alarm is all I need. But I was happy to buy an android phone. Because of it, I can write even when I’m on the bus on a trip to the province. On my 24th, I had a Parade, Fireworks and a Royal Banquet. And it had been really really great! And that was my 2012: emotional, nostalgic, victorious, tragic, depressing, enlightening. But overall I’m thankful for this year. Realizations came up this 2012, realizations that may not have come if things went differently. So on 2013, it’s time to deal with life with a completely different perspective, an entirely positive one. And I would want to ask God to accompany me in doing so. And if you have observed, I have that habit of keeping every baggage. Only a few items were on sale and ready for disposal. This is also one of the reasons why I put up this baggage counter. So in 2013, I want to change that habit and start learning to let go of things.